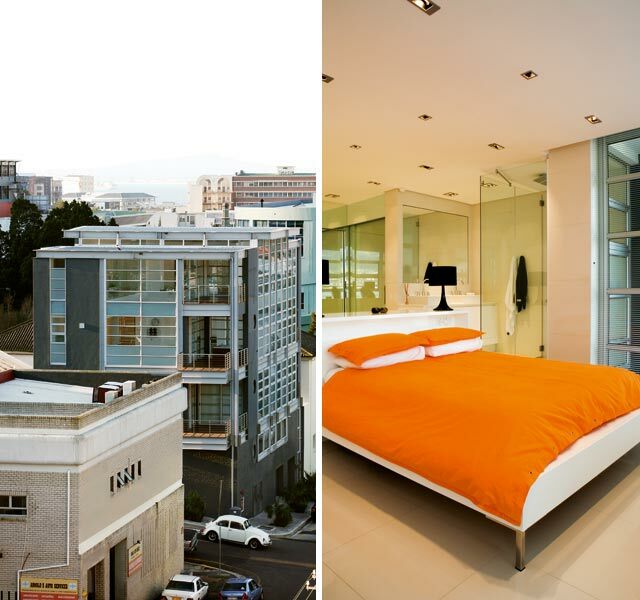 Built in the 1940s, this industrial structure in the heart of Cape Town was adapted into two high-end apartments by architect Don Albert. Located in an area of somewhat confused context, it counts a 19th-century church, office structures and even motor-repair shops as its unexpected neighbours. It is, however, this sense of disjunction which informed the re-design of the building with its newly robust masonry base in dark grey, and expressed steel structure. The upper apartment levels were transformed with glass which replaced the existing brickwork. ABOVE: The apartment’s all-white theme continues into the kitchen with funky kitchen appliances providing a splash of strong colour. 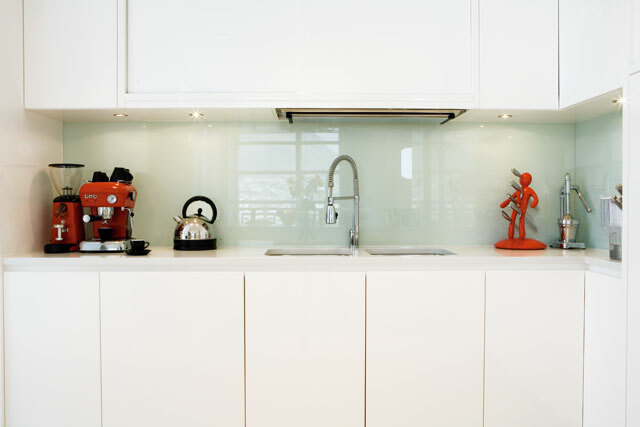 The glass backsplash is available from GlassKote. Because of its tricky location (being a listed conservation area) bureaucracy at council abounded in trying to achieve a true contextually appropriate response, and meet the requirements of the client. Maintaining a tension between old and new, the building exhibits industrial-type detailing on the exterior. This is carried through to the reception areas, where heavy handrails offset the gleaming high-gloss porcelain tiles, revealing a glimpse of what lies beyond the massive front door. 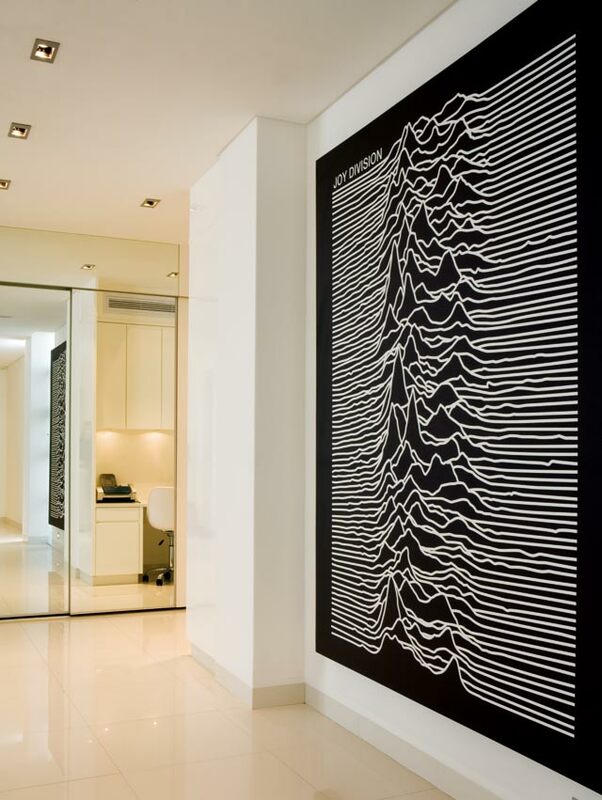 ABOVE: An oversized print of a Joy Division album cover depicting an abstraction of sound waves takes centre stage in the entrance area. Full-height mirrored sliding doors reflect a cleverly tucked-away work area at the back. 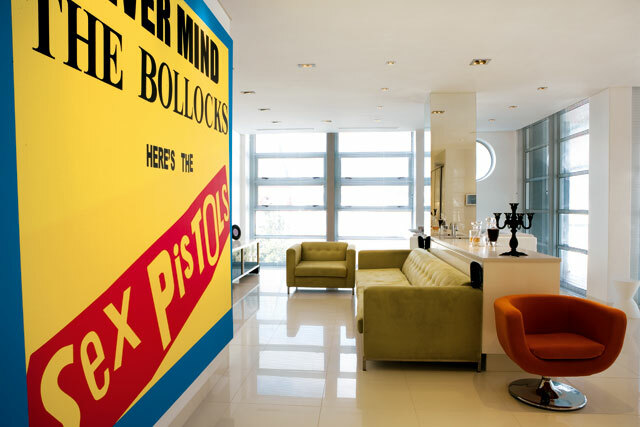 Owner Rui Estevez, founder of the popular Vida e Caffé coffee-bar chain, adorned focal walls with enormous canvas prints of rock-album covers. 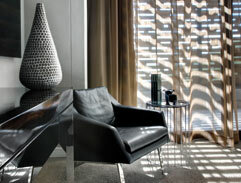 A few key pieces of structured furniture punctuate and demarcate functional zones. Cabinetry and kitchen detailing is intended to disappear into this abstract spatial expanse. The reflective glass walls further enhance the space’s fluidity, placing special emphasis on a few retro kitchen appliances. 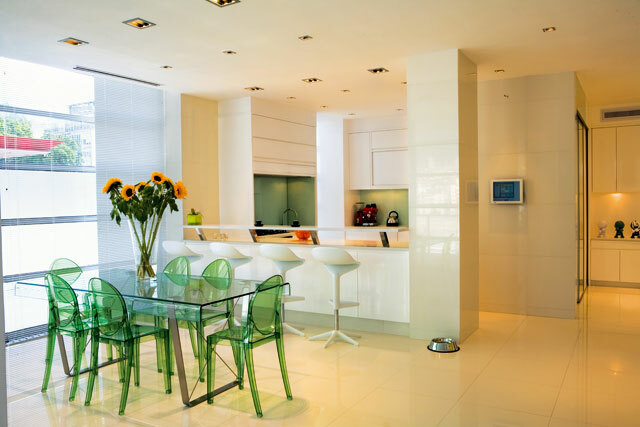 A home-automation system provides an intelligent ‘nervous system’ for the apartment, controlling, amongst others, the lighting, security and sound within the space and enabling the pure-white surfaces to take on an array of personalities and identities at different times of day and night. The idea of transparency pervades this light-filled apartment, and every item of furniture has a considered placement within the space. The owner abandoned the idea of curtaining in favour of sandblasting the lower glazed panels of the windows, where a certain amount of privacy was required, maintaining the apartment’s clean lines. A grid structure has been set up, where the recessed light fixtures fit in with the strict right-angled design of the apartment. This geometry is further strengthened by the perfect joints between the floor tiles. 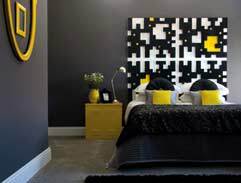 It is this subtle reference to a modernist clarity that creates the sense of calm and order within the apartment, where all fixed parts of the space form a recessed backdrop to the vibrantly multi-coloured additions of playful furniture and colourful objects. 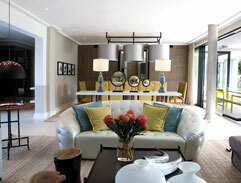 The main bedroom is a generous space with an ‘island-type’ bed hovering in the centre, with the vast bathroom and mirrored dressing areas behind. The clever location of this bank of mirrored sliding doors reflects the view out towards the city and allows an awareness of the context of the building at all times. with a sense of calm and surprise.